Lent is a time to Reflect, Reboot and Reconnect with our Spiritual selves. Join us at St. Augustine as we draw closer to Christ and one another at a Lenten retreat for the whole family. Father David Mary Engo, resident priest at Christ Prince of Peace, our Diocesan Retreat Center, and Mr. George Valadie, president of Notre Dame High School, will lead us in a reflection on the Passion of Christ and speak about how we can hear our Lord amongst the busyness of everyday life. The retreat begins Friday evening at 6:30 with Stations of the Cross followed by dinner and a talk from Fr. David Mary. Saturday participants will gather at 9 am over a light breakfast and will hear from Mr. Valadie and Fr. David Mary. There will be Lenten activities for children in Kindergarten through 5th Grade and childcare for infants and toddlers. Middle and High School students will also have activities during the retreat. The cost is $10 per person or $30 for families. If cost is prohibitive, please contact Father Joseph as the fees can be waived. Please register for this event so we can plan for food. 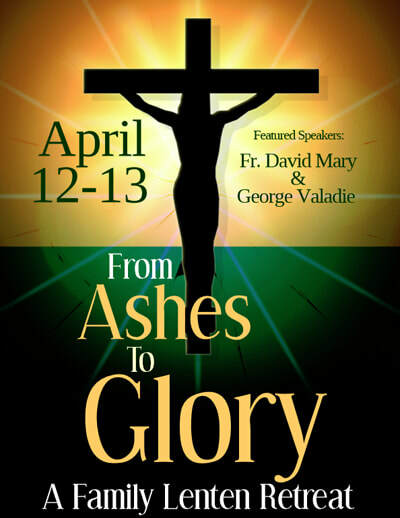 You can register by calling the parish office at 423-886-3424 or online. The cost is $10/person or $30 / family. Payments can be made in the parish office or at retreat registration.